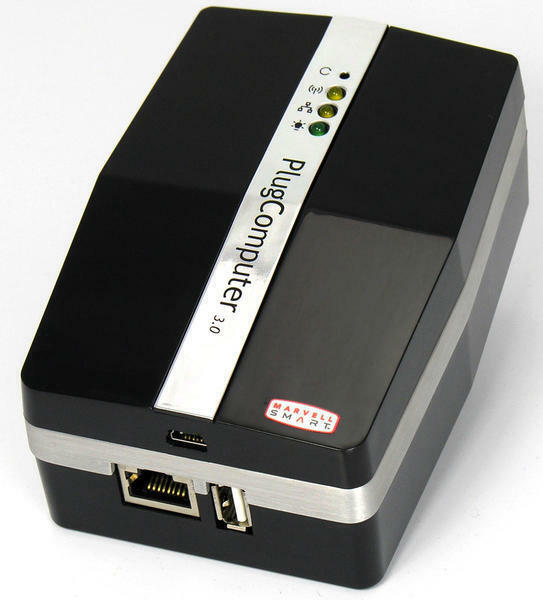 The Cirrus Plug 3.0 from Ionics with 2GHz ARM processor, WLAN b/g, Bluetooth, and internal 120GB hard disk is about the size of a Coke can. The device is displayed at CeBIT Hall 2. On display at CeBIT is the mini-computer from Dr. Bott KG at Booth A20. Next to a simple Cirrus Plug from Ionics that also includes USB 2.0, GBit Ethernet, and a 1.8" SATA hard drive, Dr. Bott also demonstrates a mail server appliance on a Cirrus Plus basis. As with most Plug computers with ARM processors, the Cirrus comes with Linux. According to Dr. Bott, the PMS mail server was ported in as little as two days from a VIA platform with BSD UNIX to a Cirrus Plug with Ubuntu Linux and can work even on first-generation SheevaPlugs. The Cirrus Plug from Ionics should sell for around US$ 400, with the first series of devices available not until Q3 2010. Ubuntu will be pre-installed. Further details are at http://www.plugcomputer.eu.